Grunhelda Boogenhagen was a broom dealer on the west end of Market Street. 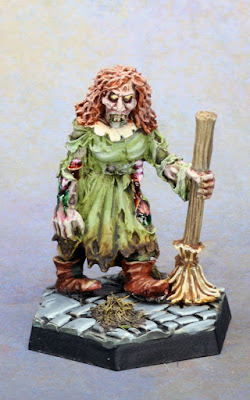 New, used, and factory refurbished, Grunhelda sold all makes and models of brooms from her well-tended stall, and offered to those that could afford it her coveted bespoke broom-making and repair services. Neither rich nor powerful, she was closing up her stall to go and watch the Mayor's fireworks display when the Necroburgher's curse struck. Now a shambling corpse, Grunhelda wanders Karr-Keel collecting any brooms she happens upon as the town falls into ruin around her. So for wave 2 of the Zombies of Karr-Keel, I decided to show my progress as I finished them instead of all at once. 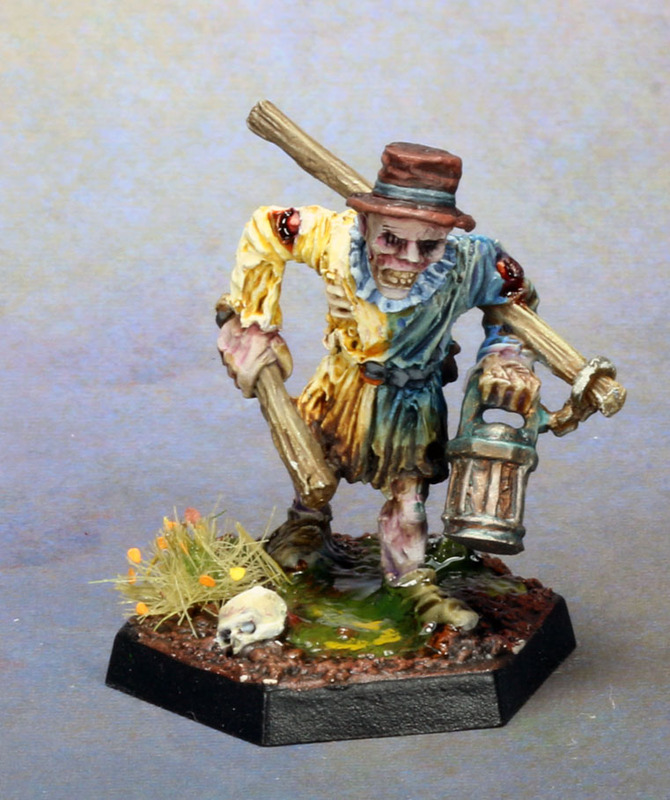 Mostly, because I'd run out of blog posts while I get all 12 painted. In this batch, I went back to the flesh recipe of GW Baneblade brown, highlighted by mixing in VGC Off White and glazed with thinned GW Naggaroth Night, Baal Red, and Bloodletter Red. Grunhelda's dress was based with GW warboss green and highlighted by mixing in P3 Menoth White Base. When that was done I stippled the bottom of her dress with mixes of GW Seraphim Sepia Typhus Corrosion at various mixes to simulate dirt and dust buildup. Her collar was VGC Bronze Flesh mixed with VGC Off white. 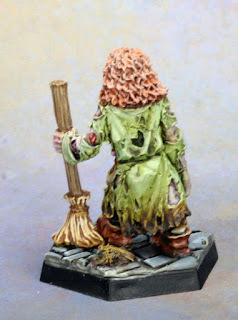 Since she sells brooms, I had the image of a witch and decided to give her red hair, which was based with an old pot of GW Vermin Brown, washed with Reikland Fleshshade, and highlighted by mixing in GW Celestra Grey. Overall, she was pretty simple. Grunhelda's base was done with a greenstuff world small bricks roller. That was painted with GW Mechanicus Standard Grey and highlighted by mixing in VGC Off White. The dust piles were created by mixing Striland Battlemire with static grass and when that was dry, drybrushing them with Zandri Dust. A Sergeant in the Karr-Keel Nightwatch, Waddrup's lack of enthusiasm for actually doing his job was legendary among the denizens of the city's dark underbelly. Certainly, he was as quick to use his truncheon on an unlicensed beggar as any member of the watch, but he had no problem overlooking a little bit of larceny in exchange for a full belly, a cold beer, and a pocket full of small coins. What do you expect for a penny a night? A well-trained and dedicated police force? No. Waddrup was a creation of the system, and he did what he had to do to keep his small comforts and avoid a knife in the back in a dark alley. Of course, none of that really matters anymore. When the Necroburgher's curse fell upon Karr-Keel, Waddrup was just starting to walk his beat, trusty pole lamp in hand and a whole night of bribes to look forward to... one last patrol to last him through an eternity of undeath. Since Waddrup was a watchman, I figured he needed a somewhat "fancy" uniform. So I split it blue and white. The white half was done the same way as Grunhelda's color although I applied a 50/50 mix of Seraphim Sepia and Casandora Yellow. The blue was based with Kantor Blue and highlighted by mixing in P3 Menoth White Base. 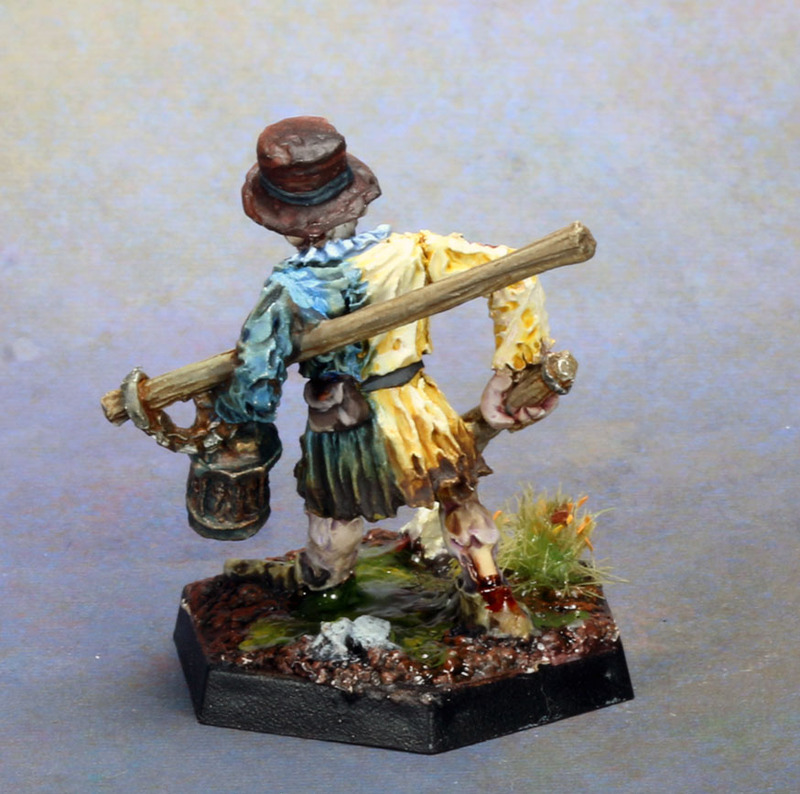 Afterwards, the blue was washed with Agrax Earthshade and then Drakenhof Nightshade. His hat began with GW Rhinox Hide and was highlighted by adding Doombull brown and then some tan color from the VGC range, who's label has rubbed off. The lantern was VGC Brassy Brass highlighted by mixing in Scale 75 Speed Metal and then washed with Secret Weapon Algae and then GW Nihilakh Oxide. His base was done exactly the same as the cart. Big WOOOOW! Excellent looking minis sir! I could look at these all day long, Andrew. I love the skin tones, the hair, the faded designs on the clothing, the dirt. Really inspired work! Wow, thanks for the compliment! They look great Andrew. I'll have to leave mine for awhile so I can forget how good yours look when I do mine. 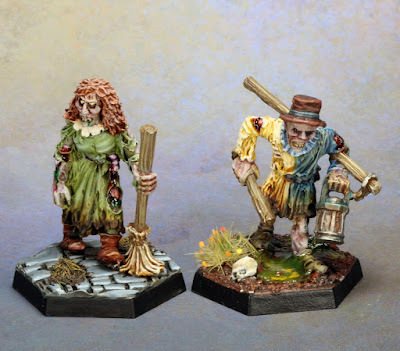 Love the colour choices on this pair and of course the sculpts are up to their wonderful crisp oldschool vibe standard. Good stuff mate. The Answer to the Norman Conundrum, or Crusaders!